I'm not sure why anyone expected the friendly carnival atmosphere to hold, but it didn't. 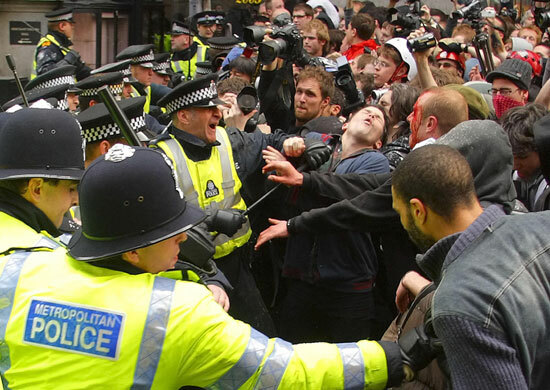 Sporadic clashes between protesters and police continued into the evening as officers refused to allow demonstrators leave the streets around the Bank of England. Plastic bottles and toilet rolls were thrown at police as the crowd chanted: "Let us out." Simon O'Brien, a Metropolitan police commander, said officers would be making further arrests in the coming days. He also said police would be asking the peaceful "flash camp" of more than 100 tents pitched on Bishopsgate to move on before the morning.